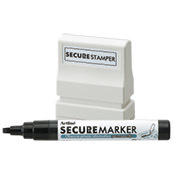 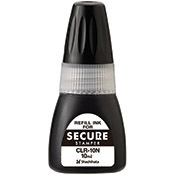 Protect yourself with our secure stamp and marker. 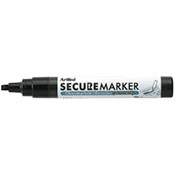 These high-quality redaction tools, with our unique black ink formula, obscure private information on mail and other documents. 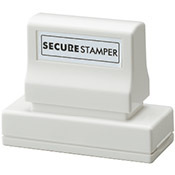 Covered information cannot be easily read, scanned or copied. 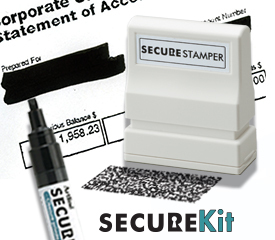 Our Secure Kit: obscures private data and comes with pre-inked stamp and chisel nib marker. 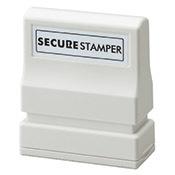 Stamp is re-inkable. 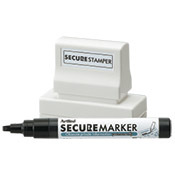 Perfect for use on: credit card statements, legal contracts, junk mail labels, prices on gift tags, prescription bottles, magazine labels, etc.